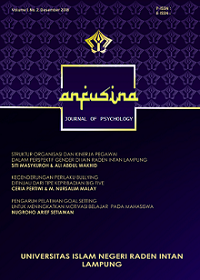 ANFUSINA: Journal of Psychology [ISSN 2654-5470] is a journal published by the Islamic Psychology Program, Faculty of Ushuluddin and Religious Studies, State Islamic University of Raden Intan, Lampung. Publish twice a year in April and Oktober. Anfusina focuses on developing psychology.